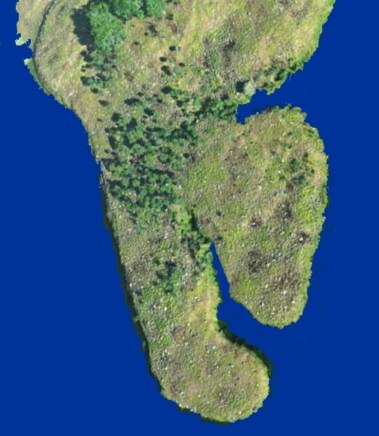 Before the arrival of European explorers, Manhattan was a hilly, forested island populated by a Native American tribe called the Manates. (Manhattan Island's name comes from the Indian name Man-a-hat-ta, which means land of hills.) The Italian explorer Giovanni da Verrazano was the first European to enter New York harbor in 1524, although he never set foot on land, but traded with the natives who came out to investigate. He brought back reports to his patron, the King of France of the wonderful natural harbor, friendly natives, and rich agricultural lands to the west. In 1609, Henry Hudson, under the employ of the Dutch East India Company and looking for a passage to the east, explored the entire coastal area and most of the way up the river that now bears his name. Shortly thereafter, other explorers and traders followed, and soon a thriving trade in furs began between the Dutch and the Indians. In 1621 the Dutch West India Company was formed primarily by fur traders to exploit this trade. In 1623, the first Dutch settlers arrived and settled on Governor's Island. 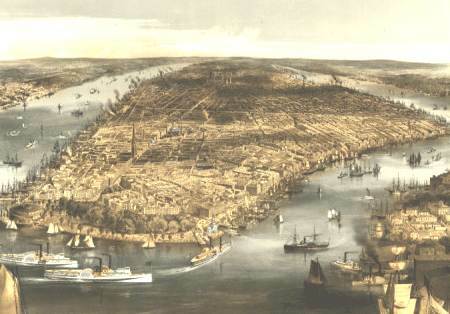 As more arrived, the Dutch West India Company established a settlement on the southern tip of Manhattan at the current site of Battery Park. Peter Minuit was appointed as the colony's director and according to legend bought Manhattan Island from the indigenous residents for 24 dollars worth of trinkets; Minuit paid slightly more—about 60 guilders or $40. The Dutch promptly renamed it New Amsterdam. In 1653 Peter Stuyvesant, the new director, built a fence along present-day Wall Street to protect New Amsterdam from British incursion during a war between England and the Netherlands. Ultimately, King Charles II of England decided to seize New Netherland (New York colony). In 1664 his brother, James the Duke of York entered New Amsterdam harbor with four gunboats and demanded the surrender of the village. Stuyvesant's efforts to rally the citizens of new Amsterdam failed because the community decided that it was better to surrender and be allowed to keep their wealth than to fight and lose everything. The British took over without firing a shot and the Duke of York renamed New Netherland and New Amsterdam with the same name -- New York. Nine years later Britain and the Netherlands went to war again. This time the Dutch were the invading force. They sailed their warships into the harbor and retook New York City. The city was again renamed—this time New Orange, after the Dutch Prince William of Orange. However, when the war ended a year later, New Orange was returned to England as part of the peace treaty. The name was changed back to New York and so it remained. The colony of New York and the other Eastern colonies grew fairly peacefully under the jurisdiction of the British crown until the British decided, in 1765, it was time to tax the colonies to defray the costs of defending the English territories in the New World against French aggression. In spite of the fact that the taxes were negligible compared to what London citizens were paying at the time, the colonists considered them very unfair because unlike the citizens of London, the colonists had no representatives in Parliament and therefore no say in how they were governed. It wasn't long before the colonists banded together to resist the taxes and started taking out their displeasure on the tax collectors. That caused King George to send troops to protect his tax collectors and English property. Further resistance by the colonists to the English attempt to regain control of their colonies ultimately led to the Declaration of Independence and American Revolution in 1776. Because of its strategic importance, control of New York City was a key objective for both sides. Unfortunately, early in the war the colonists were unable to hold the city in the face of the overwhelming superiority of British forces, and the British occupied the city during the entire war. In 1781 the British surrendered at Yorktown and the British army finally withdrew from New York City in 1783 after seven years of occupation. After the Revolutionary War, New York City became the first capital city of the United States. In 1789 the old city hall was renamed Federal Hall and became the nation's first capitol building. George Washington, standing on an open-air balcony, took the oath of office to become the nation's first president. The opening of the Erie Canal in 1825 caused explosive growth in New York City and the surrounding areas, because the canal opened a trade route for moving the resources located in all of the areas adjacent to the Mississippi river and the Great Lakes to New York City. The city's location also made it the crossroads for most European trade with America. Modern New York City was formed in 1898 with the unification of Manhattan and the other five boroughs, an event that increased the city's area tenfold and doubled the population to make it the world's second largest city, after London. New York City has continued to prosper, and today it is the most populous city in America as well as the economic center of the world. This vibrant city has had some tough times along the way, but throughout its history it has been well served by an excellent location, visionary leaders, and hard-working citizens.